Sprouts Farmers Market is likely to be the next Whole Foods Market. There are several reasons for this, the most important of which can be found here. Sprouts Farmers Market (NASDAQ:SFM) isn't going to hold up well in bear market environments due to its small size. Therefore, if you're looking for something short-term, then you're in the wrong place. On the other hand, if you're looking to invest in a high-quality company with tremendous potential over the long haul, then you have found Eden. If you follow this column, then you already know that Sprouts Farmers Market offers "Healthy Living for Less." The company's slogan isn't "Healthy Food for Less" because it intends to educate its customers, not just sell them products. Therefore, when you're in the store and you're reading a label that is as familiar to you as Ter Sami, there will be no reason to fret. A smiling (literally) worker will be available to answer any questions -- especially if you're in the supplement and vitamin section. The real key, though, is that Sprouts Farmers Market is just beginning to expand geographically. Due to lower prices, Sprouts Farmers Market might have potential to steal market share from Whole Foods Market (NASDAQ:WFM) down the road, but Whole Foods is still the clear leader in this space. Whole Foods might have lowered guidance for fiscal-year 2014, but these weren't massive swings, and the news is still positive. 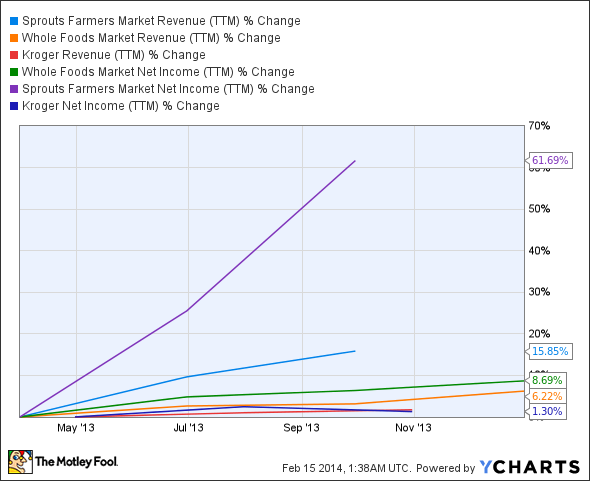 For instance, Whole Foods now expects a full-year sales increase of 11%-12% versus a prior expectation of 11%-13%. Comps are now expected to grow at 5.5% to 6.2% versus a prior expectation of 5.5%-7%. And diluted earnings-per-share is now expected to come in at $1.58-$1.65 versus a prior expectation of $1.65-$1.69. Expectations have lowered slightly, but if you look at the facts, it's still a growth story. Also keep in mind that sales increased 10% to a record $4.2 billion for the first quarter year over year. Looking way down the road, if you lived in an area that one day featured a Whole Foods and a Sprouts Farmers Market within driving distance from one another, then you might opt for the store offering lower prices. However, by that time, Whole Foods might develop a strategy to maintain its lead over Sprouts Farmers Market. On the other hand, if you're looking for a solid dividend investment, then you might want to consider Kroger. Its 1.80% dividend yield is higher than Whole Foods at 0.80%. Additionally, Kroger is only trading at 13 times earnings, whereas Whole Foods and Sprouts Farmers Market are trading at 36 and 117 times earnings, respectively. All three companies are impressive, but when you think of a supermarket, it's not likely that you think of technological superiority. Sprouts Farmers Market fits into this category. Here's why. Sprouts Farmers Market has partnered with Salesforce.com to market in the cloud. Sprouts Farmers Market wants to be able to reach customers the same way those customers want to reach Sprouts Farmers Market. This has led to nearly 500,000 social customers. Sprouts Farmers Market is also using Salesforce Chatter (like Facebook for the business world) via the cloud for internal communication. This allows for networking opportunities, including vendors. At the moment, anyone who works for or shops at Sprouts Farmers Market can gather information on the company through the cloud. Additionally, there are groups set up on the cloud so stores can interact with one another on all levels at all times. If you have ever walked into a grocery store (very likely), then you have noticed an office in the front or back of the store. A manager often sits in a chair, one hand holding the phone, the other hand's index finger slowly pecking at a keyboard attached to an 1990s-like computer. His eyes are likely peering over papers that are loosely strewn about a rickety old desk. You won't find this at Sprouts Farmers Market. If you're looking for nostalgia in a different sense, however, then you might enjoy the 1950s music playing over the speakers that gives the store an energy you don't often find while grocery shopping. The reason you won't find that old school office at a Sprouts Farmers Market is because it's not necessary. All managers and department heads are equipped with an iPad, allowing them to walk around the store and communicate with other team members electronically when necessary. This improves efficiency. Sprouts Farmers Market has completed the technological trifecta with big data. After going from 50 stores to 150 stores -- and with future geographical expansion likely -- this was a necessary move. Sprouts Farmers Market uses big data for merchandise analytics, sales projections, margin evaluations, labor effectiveness, and more. The best part is that all of this information is instantly available via big data. Look at Macy's or Nordstrom in retail. They established leads over their peers by investing in current and future technological trends. They were proactive opposed to reactive. By Sprouts Farmers Market taking this approach, it demonstrates that the company is foresighted. While this doesn't guarantee a technological advantage, it does indicate quality management, which was what any long-term Foolish investor wants to see. Wouldn't it have been nice to invest in Whole Foods before it became a household name? For shareholders, it was a bumpy ride for about a decade. Those who were patient struck gold. If you have a decade on your hands, or if you're investing for someone with a long-term time horizon, then you might want to consider Sprouts Farmers Market. It will be a rough road, but thanks to technological savviness and targeting an untapped market by selling natural and organic food for affordable prices, there should be a bright light at the end of a long and windy tunnel. Please do your own research prior to making any investment decisions.